Just listen,' Adam says with a voice that sounds like shrapnel. I open my eyes wide now. I sit up as much as I can. And I listen. 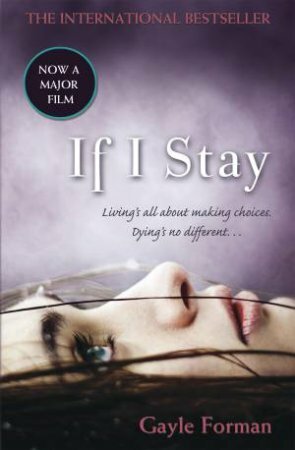 With the exception of a handful of things I loved, Gayle Forman's If I Stay didn't really tick many positive boxes for me. I really wanted to love this book, and as much as the positives were powerful ones, the negatives just far outweighed any light the positives may have shed. I can't stand passive writing and felt like the book could have used a more thorough edit. And c'mon, really, nobody has a family life that happy, I could see that Forman tried to remedy that by giving Mia's mother a strained relationship with her own family, but it just fell flat. The best part of this book was the ending. Even though it left me hanging and in desperate need to read the sequel. It is by far the most emotive part of the story and gave me a small lump in my throat and Adam's thoughtfulness in bringing the music to awaken Mia is boundlessly romantic, as are his heartfelt words. But, on the whole, Gayle Forman's If I Stay was a below average return on my emotional investment in the story.